The scene in Buckie during the rescue operation. Picture by John Duncan/HM Coastguard Moray. A woman has died after being pulled from the water off the coast of a Moray town. Buckie and Portsoy Coastguard crews received a call saying a 61-year-old woman was seen in distress near Buckie harbour just after 7pm yesterday. Police and ambulance crews also attended the scene at the town’s north pier after the woman, believed to be in her 60s, was spotted in the water. She was pulled from sea by lifeboat crews and airlifted to Aberdeen Royal Infirmary by a coastguard helicopter, but could not be saved. 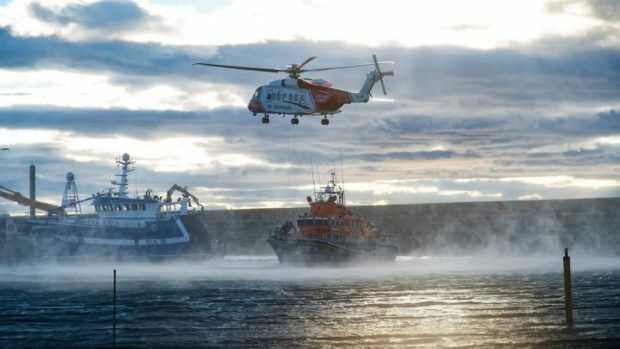 A coastguard spokesman said: “Coastguard and harbour personnel entered the water to rescue the person who was recovered onto the lifeboat before being taken by helicopter to Aberdeen Royal Infirmary. “Sadly, despite everyone’s best efforts the person died in hospital a short time later. Our thoughts are with the person’s family and friends at this time.